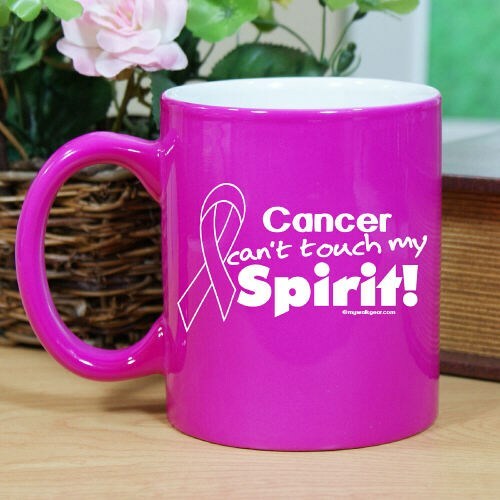 Show that nothing will get in your way of fighting for a cure with this great Cancer Awareness Ceramic Mug. Choose between one of our 6 mug color choices and proudly turn this Ceramic Mug into the awareness you are trying to promote. Each Awareness Mug holds 11oz. of your favorite drink and becomes an instant and supportive Breast Cancer Gift you can enjoy each and every day. Additional Info MyWalkGear.com was created with one goal in mind. That goal is to help those who help spread awareness. You will find many ways to show your support when you browse through our selection of Awareness Apparel & Walk Gear. A portion of our proceeds will be donated to the cause of your choice. Be sure to also take a look at our Hope Survives Awareness Mug as well.